Monstrous Matters: I'll write it here for all the world to read: The Green Lantern movie was not that bad! I'll write it here for all the world to read: The Green Lantern movie was not that bad! Over at Rotten Tomatoes on Tuesday, they posted a gallery of DC's superhero movies, ranked best to worst according to the famous Tomatometer. Now, there are some clear issues with the methodology. Glancing at the list reveals that some of the obvious entries are about where they should be...such as The Dark Knight and the first two Christopher Reeve Superman films leading the charge, and Catwoman falling near the end. I'm not sure that Supergirl should be last...but the biggest problem is probably with Tim Burton's 1989 Batman. How in the world is it #10? This may not seem so bad when you consider that most of the films above it could be argued as better works...but, it's rather laughably wedged in between Superman Returns and Watchmen. Why is it that I hardly ever see GL at least given a little bit of credit for being a fun movie? Please note that, in that Rotten Tomatoes list, it falls a full two spots below The Return of the Swamp Thing. Now, I know I'm a little biased, as the Lanterns are some of my absolute favorite characters in comics. Is it a great movie? No, mysterious question-asker, it's not great, and Guardians of the Galaxy did eventually come along and show us what a fun, superheroic, space-based movie with a wisecracking leading man could amount to. 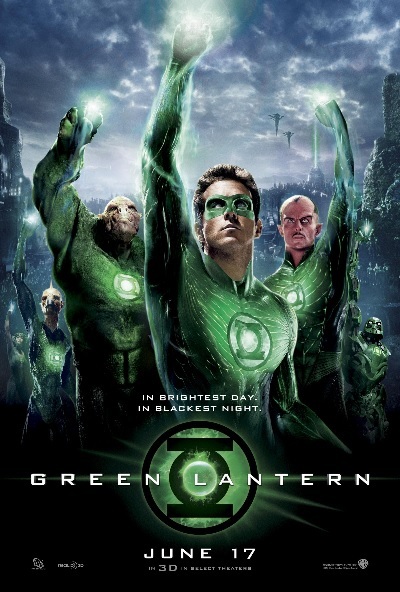 However, the makers of Green Lantern seemed to know what kind of a property they were dealing with, and they made a movie to match. Green Lantern is a story about a guy who becomes a space cop when he gets a magic ring from a dying magenta alien. It has no choice but to wear its Silver Age pedigree on its sleeve, and it has a little fun with it. There's the joke about the domino mask not really concealing his identity from Carol...the time he makes the Hot Wheels track...heck, the climax of the movie has Hal just making a huge green fist and punching the crap out of the bad guy. Why aren't more viewers acknowledging that there's something a little bit awesome about that? I try not to be a DC fanboy/conspiracy theorist, but I do wonder a bit if falling into the Marvel Cinematic Universe could have given GL a little push toward acceptance. I don't really see it falling short compared to say, Thor, which came out the same year and similarly celebrates some Silver Age themes. I like Thor, but I don't see how it falls on the side of the line marked good, while GL will be forever relegated to the side marked crap. Perhaps the worst result of the GL response is the fact that, had it been more of a hit, we might see a very different DC Extended Universe taking shape. Green Lantern looks like it was DC's one shot at making serious-but-fun superhero flick in the general style of the MCU. When it didn't work as planned, they took the opposite route, which includes stuff like putting Zack Snyder in charge of the Justice League. The DCEU is now trying to "recover" when it never really got started, and the spirit hinted at in GL is only put to good use on the small screen with The Flash and Legends of Tomorrow. We're not even getting a Lantern in the first Justice League flick, apparently. That 2011 film really did a number on GL's place in the DC Universe. Totally agree! I watched it on Blu-Ray a while back and was perplexed at why people thought it was "crap." If everyone had said it was "average" or "flawed but fun" I could have understood it. But crap? Naw. I agree as well, I thought the Green Lantern movie was a fun movie to see and receives much more criticism than it deserves. Also agree with your Tim Burton's Batman view. I just watched it last weekend and surprised myself that I forgot how good a movie it was. The Rotten Tomatoes list definitely needs adjustment. Haven't seen Suicide Squad yet, but I'm cautiously optimistic. I hope Leto lives up to what you're looking for!